Happy St. Patty’s Day! Being a redhead with a bit of Irish heritage from way-back-when, I’m a little partial to the green holiday known as St. Patrick’s Day. 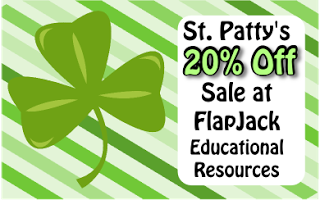 Therefore, in order to celebrate, all FlapJack titles are 20% off through Sunday! Some of my bestsellers include Kindergarten Smart Board Pack, Telling Time Lapbook, Fractions Poke Game Bundle, Spanish Lapbook Bundle, and Math Operations QR Code Bundle. And don’t forget to check out my Classroom Materials Packs! To visit my store, click either button below.